Amino acids are the building blocks of proteins, which makes them fundamental to the chemistry of all life. Without amino acids, there would be no enzymes, and without enzymes, life as we know it wouldn’t exist. Amino acids are used by every living thing on Earth, from the simplest micro-organisms to the most complex plants and animals. Thus, L-amino acid based nutrient additives have become an important tool for expert gardeners. Plants are autotrophic; that is, they manufacture their own food, including amino acids. Plants take up nitrogen through their root system in the form of ammonium ions or nitrate ions. The plant cells then convert the nitrogen into amino acids, usually in the form of glutamic acid. The glutamic acid is then transported throughout the plant and modified into a wide-range of amino acids as needed to carry out various plant functions. Then, by means of the marvel of the genetic code, the amino acids are assembled into numerous complex enzymes to perform specific chemical reactions with precise timing. These enzymatic chemical reactions include flowering, fruiting, and seed production. L-amino acids are produced by plant growth-promoting rhizo-bacteria through a process called enzymatic hydrolysis. As bacteria grow and reproduce, they exude digestive enzymes. Some of the digestive enzymes are called proteases. These compounds break down large protein molecules into smaller amino acid molecules. The amino acids are then used as a carbon and nitrogen source for the micro-organisms in the root zone, fueling growth and fortifying plant metabolism. The surplus amino acids stimulate plant growth, both directly and indirectly. Although amino acids are not technically considered fertilizers (On average, plants only assimilate about 10–15% of the nitrogen in amino acids), they do have a powerful stimulatory effect on nutrient uptake and disease resistance. Amino acids come in left-handed and right-handed forms, but only L-amino acids are biologically active. L-amino acids must be produced organically in nature to be affective. The amino acids produced through enzymatic hydrolysis retain their left-handed chemical structure and they are very biologically active. But synthetic amino acids produced through acid or alkaline hydrolysis are rigth-handed molecules and are not biologically active. 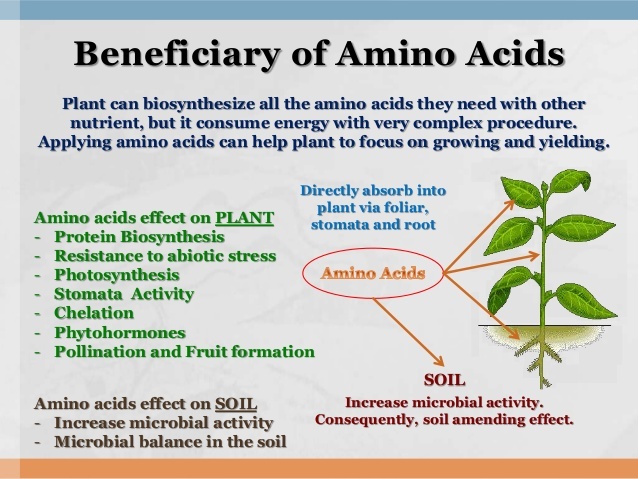 Logically then, when purchasing amino acids for plant growth, make sure they are L-amino acids. At times, L-amino acids are listed on product labels individually, but often they are simply referred to as protein hydrosylates. Some of the amino acids produced by micro-organisms can be transported directly into the plant through the plant root membrane. For example, the amino acid, tryptophan, is absorbed through the roots, transported upward to the leaves and then changed by the plant into a natural growth hormone called auxin. The auxin is then pumped to he plants extremities to stimulate new root and shoot growth. Other amino acids such as glutamic acid and glycine, stimulate root cells to open up calcium ion channels. So, instead of one calcium ion at a time entering the root, anywhere from thousands to millions of calcium ions can be taken up by the plant, strengthening its entire vascular system. The stronger the vascular system, the more efficiently the plant takes up water and nutrients, resulting in thicker stems, stronger cell walls and a greater resistance to pests and disease. But even though only a small amount of amino acids are taken up directly by the plant, they have a very influential, indirect effect on overall plant growth and vigor. Plants also exude amino acids from their roots to feed beneficial micro-organisms. For example, while plants produce amino acids for their own needs, they also secrete some of their excess amino acids into the root zone, including the amino acid tryptophan. Some root-colonizing micro-organisms are able to change plant-produced tryptophan directly into the rooting hormone IAA right on the surface of the roots. The IAA signals the plants to develop more root hairs, micro-organisms colonize the growing root mass and the cycle of life continues. Put simply, plants can produce amino acids for micro-organisms, and micro-organisms magnify the positive effects of amino acids far more than the fertilizer value of the nitrogen they contain. Another significant benefit of L-amino acids is their function as intermediate chelators. The acid part of amino acid is carboxylic acid; this acid ionizes in water to form a negatively charged chelate (Translated “claw” in Greek — see “Nutrient Chelation” on the research page) which can attach to positively charged minerals suspended in a nutrient solution. The amino acids grip the minerals, but loosely enough to release them in the plants vascular system on demand. Consequently, amino acids improve the availability of important cations, such as calcium, magnesium, copper, iron, manganese and zinc. These trace elements are co-factors that actually activate or “switch-on” many important enzymes in plant cells. The activated enzymes are able to do thousands of chemical reactions per second without being used up in the reaction. So it is, that the chemistry which defines life is thus accelerated. Amino acid blends can be especially beneficial in hydroponic applications. This is so, because if you have a hard water source such as well water, amino acids help chelate the calcium and magnesium ions in the water and prevent lime scale. Amino acids then assist with the uptake of calcium, strengthening the plant against environmental stress and many common pathogens. In indoor gardens, many hydroponic gardeners report tighter internodes and less stretching when using amino acid supplements as part of their feeding schedules, especially during rapid vegetative growth. In conclusion, it is a scientific fact that the addition of an amino acid nutrient supplement to plant cultivation projects will accelerate growth, increase fruit and flower size; enhance color, taste and overall yield quality.